There’s nothing national about National Harbor. It’s a “new city” (I was told it was a city. ), part of a relatively new movement to create “town centers” – new living , shopping, cultural centers. Easton Town Center near Columbus, Ohio and Belmar in Lakewood, Colorado are examples. National Harbor proved to be a quiet oasis with a nice harbor view. 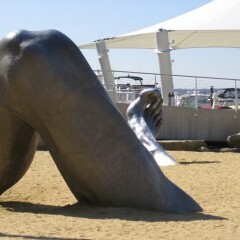 Most interesting was the sculpture in the playground – a buried giant clawing out of the sand. The sculpture by J. Seward Johnson, Jr., whose bronze life-sized people sculptures appear in cities around the world, created it for the International Sculpture Conference in 1980. 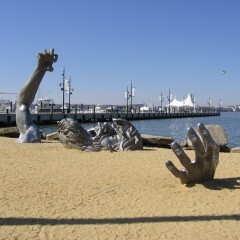 The developers of National Harbor purchased it for $750,000 in 2007 and installed it on the edge the Potomac. Kind of cool. A leg and foot emerging from the sand. Usually, we are all so busy we don’t have time or patience for mistakes or diversions. Sometimes, if only for a minute or two, it’s refreshing to happen upon something new, something that jogs our curiosity. And reminds us there is a big fun world out there! If only we take time to notice. Story and photos by Bojinka Bishop. See Comments. Click here. Share your ideas and comments. Click here. Great photo and I am going to try to remember to take the time to notice “the big fun world out there!” I hope your trip was the best. 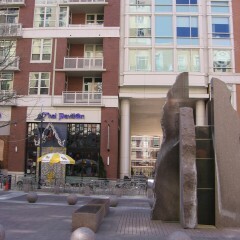 I lived in Washington, D.C. in the early 1990s and the buried giant was one of my favorite sculptures in the city. It used to be located in a more hidden location (yes, I accidentally found it one day too) so its nice to see it more out in the open! I too have missed that exit and wound up at National Harbor, I Love it there and would live there if I could afford it !